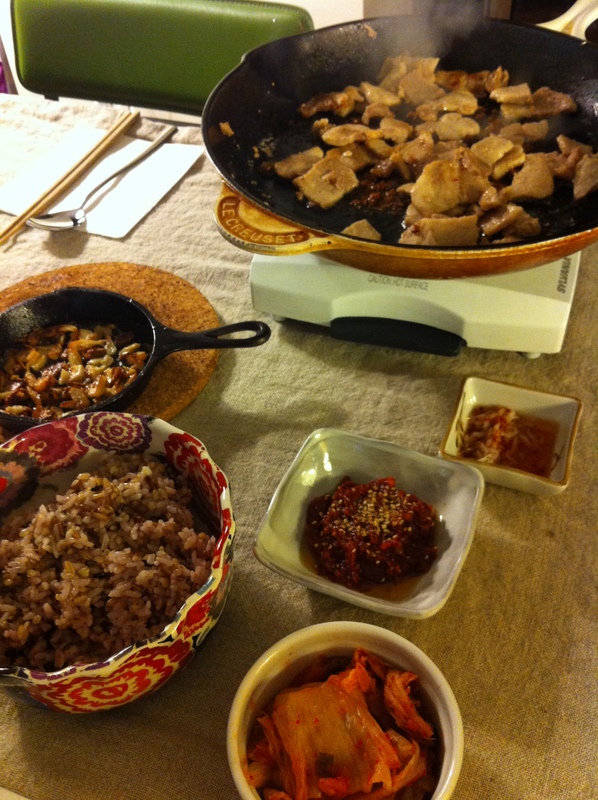 You can transfer your home into a Korean restaurant by simply grilling some pork belly and by having the right Korean condiments. 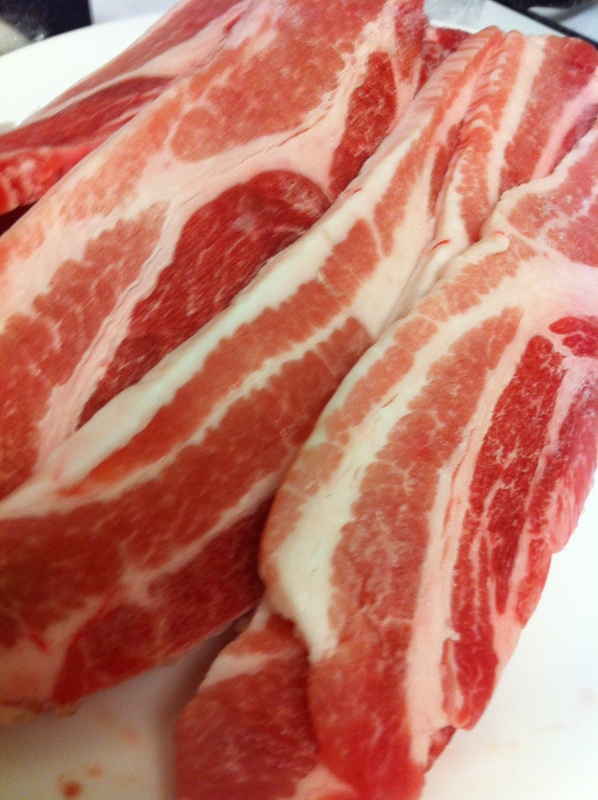 Samgyupsal-guyi (삼겹살구이)means grilled (guyi) pork belly (samgyupsal). It can be cooked on a barbeque grill, indoor grill, charcoal fire or on a skillet as I did today. Ssam means a vegetable wrap made of any variety of lettuces, fresh or cooked, but classically consists of red leaf lettuce and perilla leaves (깻잎, often called sesame leaves). 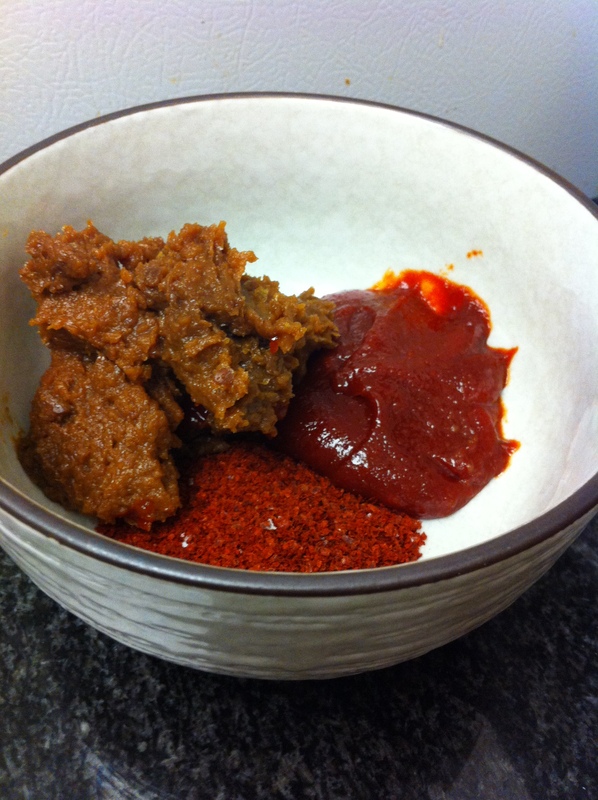 One essential condiment for a perfect ssam is ssamjang, which is a combination of the trinity of Korean cooking ingredients, duenjang (된장), gochujang (고추장)and gochugaru (고추가루). I impress my friends with homemade ssamjang, which is extremely easy to make although packaged ssamjang is easily found in Korean supermarkets. Needless to say, home-made ssamjan makes a world of difference. 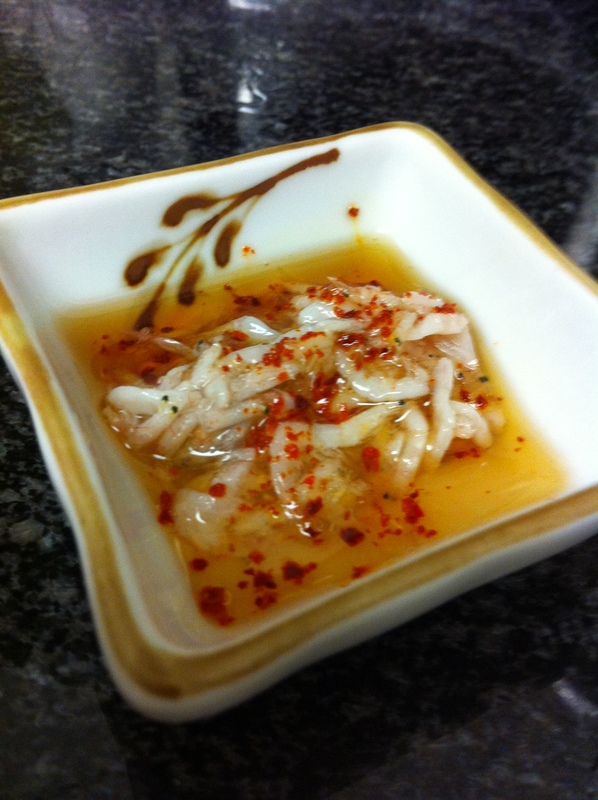 Any other condiments are up to you, but please do serve kimchi! 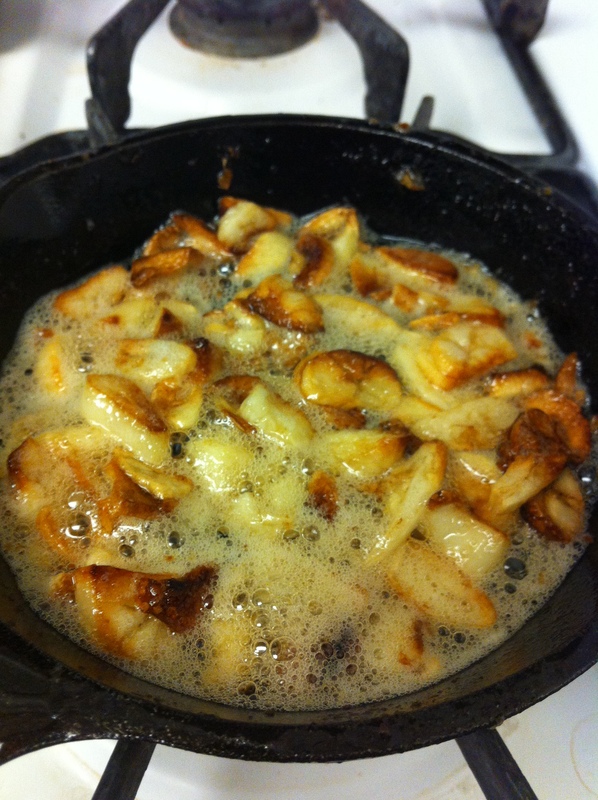 – Place thinly sliced garlic into a very small cast-iron skillet, sprinkle salt and sesame oil and cook over low heat until the garlic become golden brown and crispy. Wash the red leaf lettuce and perilla leaves individually and soak in cool water. This helps to liven the leaves. Grill the pork belly. When it is half cooked, cut it into bite size pieces with cooking scissors. 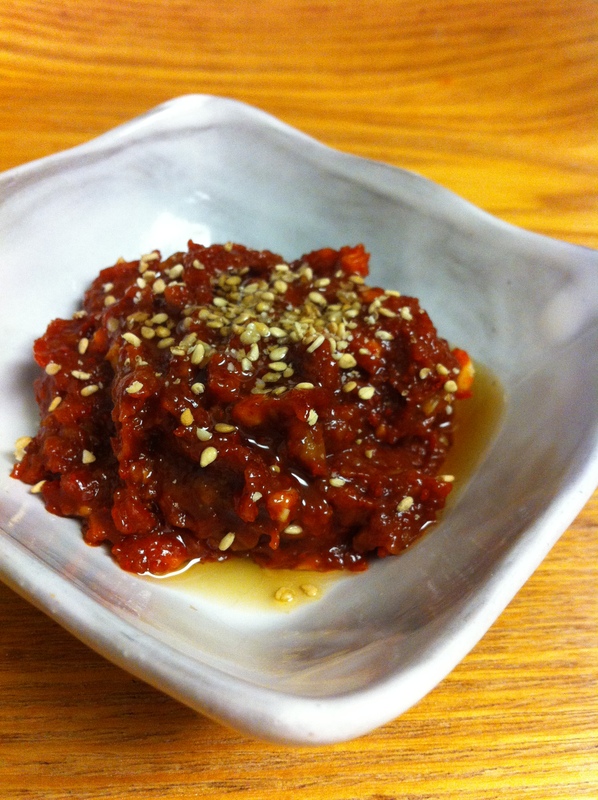 When the meat is thoroughly cooked and crispy, make a delicious ssam and enjoy! 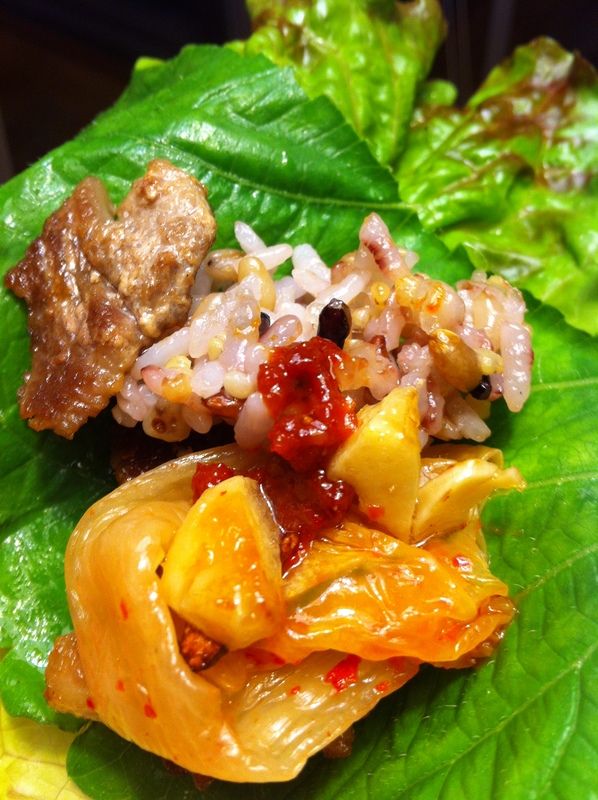 I like to place a perilla leaf on top of a red lettuce leaf, then add a little rice, pork dipped into one of the sauces, a slice of roasted garlic, kimchi and a bit of ssamjang. This entry was posted in Good for dinner, Main Dish, Meat/Chicken and tagged Korean BBQ, Malneujang, Pork Belly, Samgyupsal, Ssamjang by gangnamkitchen. Bookmark the permalink.